The supplies you need are simple, inexpensive and easy to get just about anywhere. 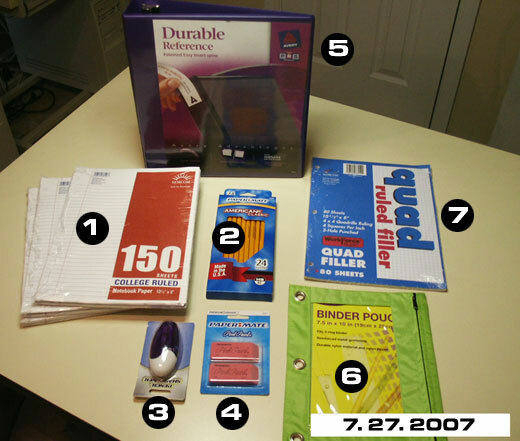 You need to have everything by the second Monday of the school year which is Monday, August 22, 2011. You should have ONE convenient place at home to store all of your extra paper, pencils, erasers, etc. Every weekend top off your notebook to keep it full of paper, pencils, etc. As the year goes by you will have a good idea of how often you need to go to the store to keep your "extra" supplies at home topped off. Do not borrow or lend supplies, your irresponsible buddies will never grow up if you keep enabling their misbehavior. Give me a chance to get their minds right. Of course, if you show "initiative" and have a "sense of urgency" you will have everything on the first day of school, which is Monday, August 15, 2011. There may be some bonus points (no promises, do it because it is the right thing to do) if you have all of your stuff on the first day of school. There will certainly be penalties if you do not have your stuff by the following Monday. Loose Leaf Paper - Get several packs, keep a good supply at home. College or High School ruled is OK, college ruled has more lines. NO SPIRAL PAPER. Get plain loose leaf. Spiral paper makes a mess and does not stack well, it is not allowed. Get the kind that already has 3 holes. Put 50 to 75 sheets in your 3-ring notebook, keep it filled. Plain Wooden Pencils - Get a box of #2 wooden pencils. If you run low get a new box before you run out. Do not get too fancy, if the coating on the pencils is something wild it won't sharpen easily or well. Get plain wooden pencils. The better quality ones are easier to sharpen and write with, but plain "house brand" pencils work fine. MECHANICAL PENCILS ARE NOT ALLOWED. There are two reasons for this, the first is that mechanical pencils break or run out of lead causing surprisingly frequent class interruptions and the second is that small pieces of easily and often broken mechanical pencil lead get all over the floor and ground into the tile. One person is not a problem, but when you have 120 math students a day it is a problem. I know. That is why I require wooden pencils. So don't even think of complaining, make the best of it, and get a box of the best quality wooden pencils you can. Small Pencil Sharpener - The most convenient kind will have a receptacle for the pencil shavings and will be small and as flat as possible to fit easily into your pencil pouch. If you get one without a receptacle for the shavings, PUT A ZIPLOC SANDWICH BAG IN YOUR PENCIL POUCH. That way you can sharpen your pencil at your desk without making a mess or having to get up and disturb the other students. Good Eraser - Even high quality pencils have erasers that leave something to be desired and a poor eraser will just smear the pencil marks around making an unsightly mess. At the very least, get some "cap erasers" and put the extras in your pencil pouch until needed. A much better eraser is one of the rectangular "Pink Pearl" erasers, and much, much better than that is the kind I use daily which is a white vinyl "Magic Rub" eraser made by Sanford. If you want the best of the best get either a "Mars" plastic eraser by Staedtler or a plastic "Hi-Polymer" eraser by Pentel. 3-Ring Notebook - The size of a 3-ring notebook refers to the width of its spine, or how tall it is when it is closed and laying on your desk. For this class, I recommend at least a 1.5 inch 3-ring binder. Of course you can get bigger, a 2 inch is not too big to carry around. I use a 2.5 inch every day and it is a little big to carry around. Don't get less than 1.5 inches though as you won't have room for your notes, paper, and pencil pouch. 3-Ring Pencil Pouch - In this you will carry 4 or 5 pencils, your sharpener, and your eraser(s). Graph Paper - You will only need a small pad. Put about 10 sheets in your 3-ring notebook. Keep it filled. Index Cards - New for 2011 - 2012! You will need about five hundred (500) standard index cards i.e. 3 in. by 5 in. Lined or unlined are OK, you will probably like the unlined better for our purposes, they seem to cost the same. We will be using these for making "flash cards" each week. Keep a good supply in your pencil pouch at all times. Try to buy the larger packs as the price per card is usually much cheaper. For example, Staples has 500 packs for $3.29 which works out to 0.7 cents per card. But in a 100 pack which they sell for $1.79, they are 1.8 cents per card which is more than twice as expensive! If you go shopping with a buddy and share the cost of buying stuff in larger amounts and then split it - you can save a lot of money. This is very true for paper and pencils too! Scientific Calculator (required for Algebra 2 only but recommended for all classes) - Algebra 2 students will need a scientific calculator. You don't need any particular brand but Texas Instruments (TI) makes very good ones. 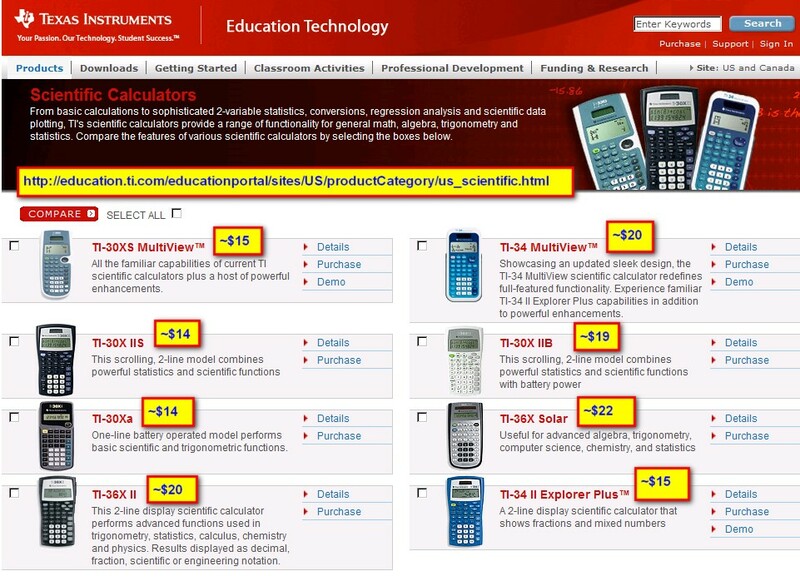 Their calculator lineup can be a little confusing so here is a summary of all the basic scientific calculators in the current TI lineup (click here for pic). Of these TI's, the one I strongly recommend is the TI-30XS Multiview. It is a "latest generation" calculator, the multiline display greatly improves accuracy and efficiency, it is solar/battery operated, and is hard to beat for about $15. The way it shows fractions and scientific notation is particularly nice. It has a powerful and easy to use function/table maker very similar to much more expensive graphing calculators. The ability to scroll up and see/use previous answers is very convenient. And the modern (TI calls it "mathprint") 4-line display beats my 10 year old TI-83 Plus graphing calculator hands down. It is perfect for the ACT. I strongly recommend that the calculator you use on the ACT is the same one you use every day. You really don't need a calculator on the ACT (except for 1 or 2 problems) and the worst thing to do is borrow some fancy calculator that is new to you for the test. TI-30XS Multiview on Amazon.com - click here. A nice set of video tutorials for the TI-30XS Multiview - click here. A copy of the TI-30XS Multiview User's Manual (pdf) - click here. Let's try shopping for the common supplies (number 1-7) at the WalMart in Oneonta. This shopping day was Friday, July 27, 2007. Let me know how the 2011 prices compare! Thanks in advance. Mr. C.
Here are the details of what I found at WalMart. One shopping tip is that things are NOT all in one place, you have to look around. The items I found are just examples, you don't have to shop at Wal Mart or get these brands. These are just good examples of what I am looking for. The before tax total is $10.20. Since sales tax is 8%, multiplying $10.20 x .08 = .816 which rounds to $0.82 so the final total cost is $10.20 + $0.82 = $11.02.